Wow, what a hang over. 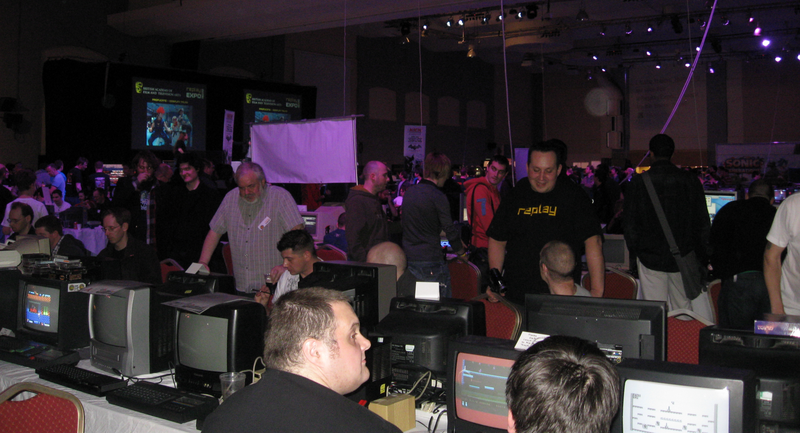 It's taken me the best part of a week to fully recover from a alcohol-fuelled weekend at Replay Expo 2011 in Blackpool, the first retro event I've attended as a regular visitor and not a stall holder (with my good friend and fellow games enthusiast John Dennis). 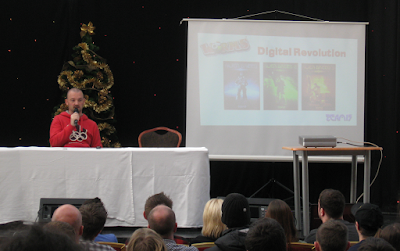 This year's Replay was held in Norbreck Castle, a venue which sadly was not as grand as it sounds, and I believe hosted something in the region of 2500 visitors on each of the two days it was open - all under one roof. 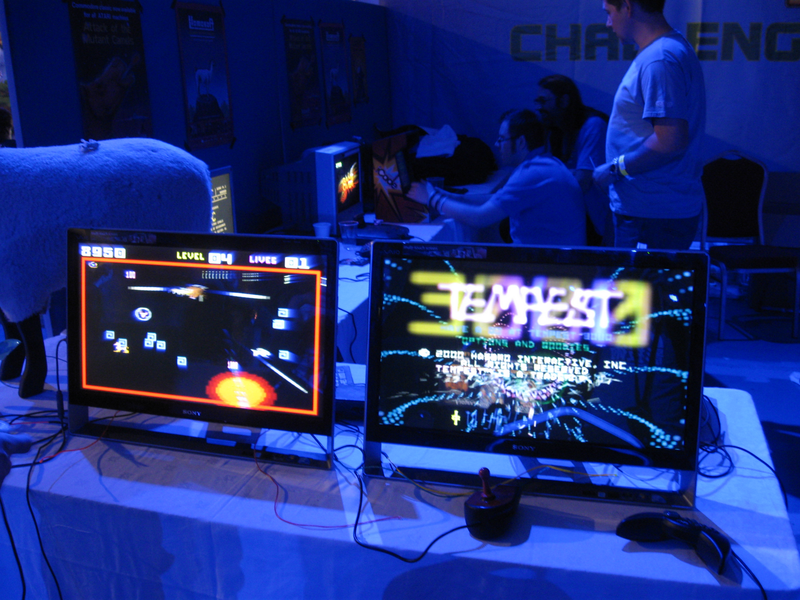 It was a massive event with loads of systems available to play on - and as you can probably imagine, there was a fair bit of retro homebrew on display as well (although sadly the modern indie scene was completely ignored - RGCD may have to bear that torch ourselves next year). In fear of boring you with trivial details (not that I can actually remember many), I'll just share a few photos and discuss some of the highlights of the show. As well as hundreds of games to play, there were also several talks and presentations though out the weekend, but the only one we managed to catch was Team 17's open discussion and review of their Worms franchise, highlighting how comparatively low-cost digital distribution has enabled them to finally bring back some of their other IPs, such as the award-winning Alien Breed reboot. They also had a stall in the main games room with a demo of Worms Golf on display (as well as a PS1 running the original Worms), but sadly they weren't at all interested in loading up Alien Breed on the XBox so I could play it co-operatively with John (for the first time since the original Amiga version was released in the 1990's). This was a bit of a shame, but we soon forgot all about Alien Breed when we noticed none other than Jeff Minter sat at a desk immediately next to them. Llamasoft's Jeff Minter (and his partner Giles) were two of the nicest people we met at the event, and were really enthusiastic to show off their latest developments for the iPad (which will hopefully be available for the PC at some stage too). Minotron: 2112 was absolutely stunning, with the player running around a single-screen arena rescuing beasties and killing surreal enemies in exactly the same manner as in the original Llamatron, yet more so. With power-ups and psychedelic visuals a go-go, its a hugely enjoyable game (and still very playable even after a few beers). We also had a quick go on GoatUp on the iCade, a simple platformer in which you must leap from level to level without falling off the bottom of the constantly upwards scrolling screen whilst simultaneously grazing, collecting goodies and avoiding enemies - a basic yet addictive formula, and the iCade is such a great piece of kit to play it on. I really can't think of any worthwhile reason to buy an iPad other than to convert it into a mini coin-op style console using this device. Oh, and thanks to Llamasoft, I also got a chance to play Tempest 3000 on the super-rare Nuon! I can't imagine seeing another one of those again any time soon. 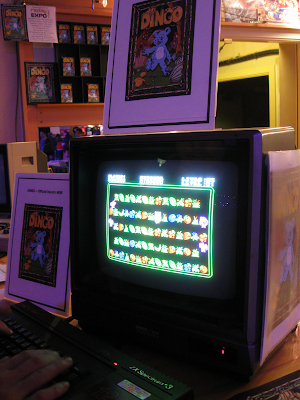 Tucked away in the back of the hall (at the Atic Bug stand) there was a Spectrum +3 proudly displaying Dingo, a game that I'd previously heard about (as being a Spectrum port of some obscure coin-op), but never played. The effort gone into promoting the game was rather impressive, with posters, mousemats and cassette tapes all over the place, and the game itself was really good too (despite making me swear quite a bit). John became particularly partial to it, racking up a decent score and annoying me by refusing to move on to check out the coin-ops. 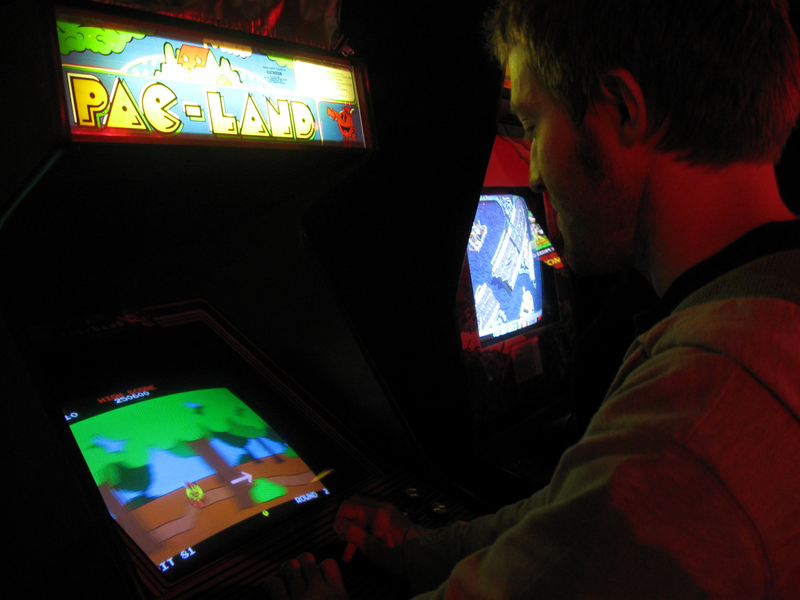 In fact, the coin-operated machines were the only let down in the main hall - they were supposedly all on free-play, but nearly every machine we approached seemingly required some undocumented button combination to add credits. The few that we managed to work out were a great laugh, but we didn't get a chance to blast the crap out of Smash TV due to the massive queues. RGCD, OSG and Cosine's Jason 'T.M.R' Kelk was running a homebrew showcase in the trader hall (next to Kenz from Psytronik), and it was here that we spent most of our time. Amongst the new releases he had on display were Callisto and Mighty Jill Off on the 8-Bit Atari, Reaxion on the ZX Spectrum, Mollusk and Edge Grinder on the C64, Skool Daze on the Oric and of course Jonathan Cauldwell's Byte Me and Tardis Remakes' Dingo (again) - which we later discovered were released especially for the event. We also bumped into Frank Gasking and his family (who just happened to be staying in the same hotel as us), and we had an interesting chat about his GTW project and some of his more recent finds (including an insane looking futuristic shmup/snooker hybrid). Seeing so many classic Commodore machines on display also provided a perfect testing ground for our next cartridge release, Fortress of Narzod (from TRSI). 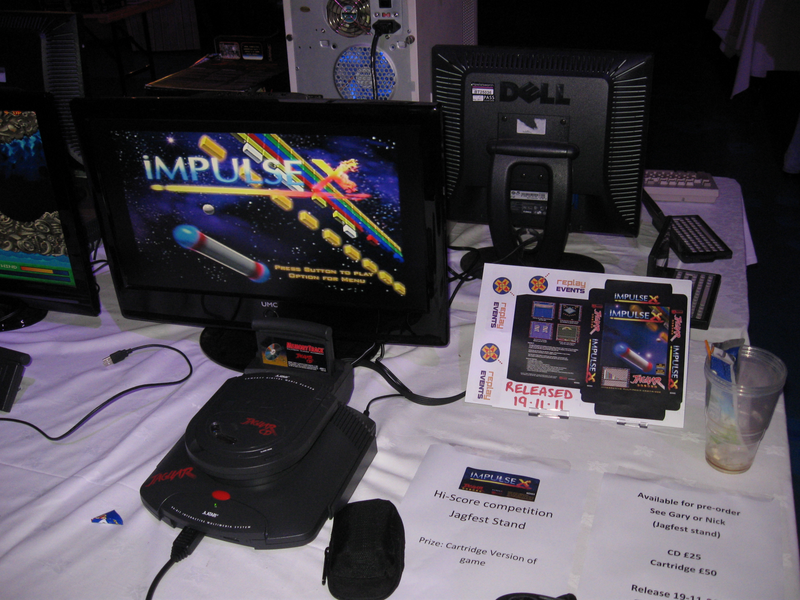 It was interesting to discover that on Kenz's famous 'Specadore' it displayed a really unusual bug that left the vector graphics reversed on screen, but thankfully it seems most likely that this was due to a dirty cartridge port and not the game itself (as it worked on all the other machines we tested it on - including a very cute SX64). 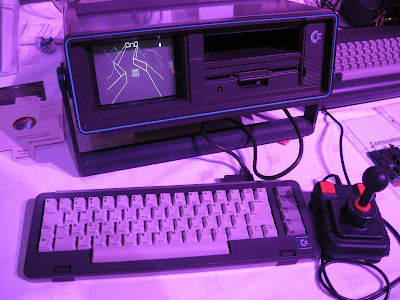 The C64 guys around the Amibay table were particularly helpful with regard to testing games, and in return for their help we let them play a sneak preview of C64anabalt and Fairy Well. Atari machines also had a healthy presence at the expo, with several Falcons (including one for sale for a bargain £500) and even a Jaguar running a new game (somewhat inspired by Arkanoid) called Impulse X. I gave it a few goes, but I just can't get on with joypad-controlled breakout games - you really need an analogue device for accurate play, and sadly there wasn't one on offer here (although they are supported). 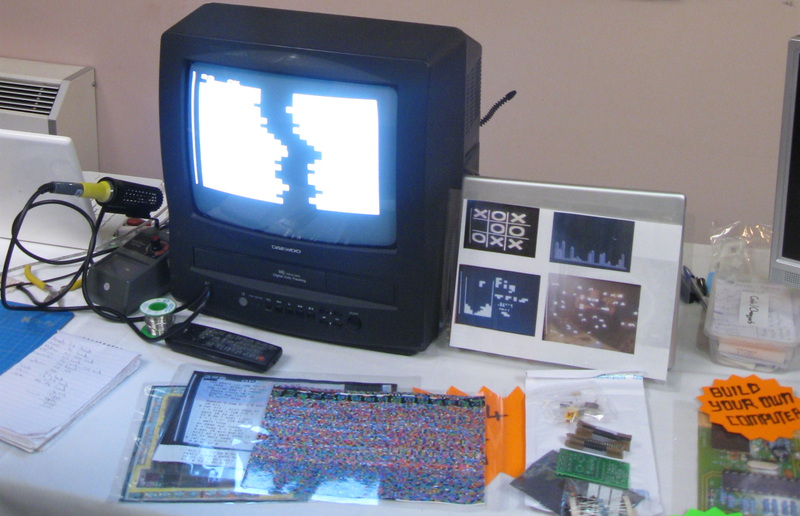 Lastly, whilst making our exit we noticed the Fignition, a £20 build-your-own 8-Bit computer kit that resembled a modern day equivalent to the famous Sinclair ZX80. Unfortunately I lack the skill to assemble such a piece of kit (and I had no cash left at this point either), so I didn't buy one - but it really looks like a great project and I'll be watching the development scene closely. Maybe one for the Christmas list, bundled together with a soldering iron and first aid kit, perhaps? In all, John and I had a surprisingly enjoyable time reliving the all-day gaming sessions of our youth. John was in fact so enamoured by the support for classic machines that he has offered to join RGCD as a writer with his first review of Dingo (surprise, surprise) already underway. Who knows, maybe we'll see you there next year? Why I didn't know about it at all? I would be there for sure.